With the launch of Cheap Eats 2010 last week, Bar Idda in Brunswick East found itself in the limelight, picking up the Cheap Eats Champ award. The plaudits reminded me of our early-summer meal there, which I hadn't got to writing up. Bar Idda opened unobtrusively into the space formerly occupied by Rumi (who moved down the street a bit to bigger premises) and replaced the space's Persian focus with a Sicilian one. With all this publicity, Bar Idda may soon have just as much trouble fitting in the hordes as Rumi did. The menu of primi, secondi and contorni is, of course, designed to be shared. Starter options feature olives, sardines and the traditional arancino ($7.50 each). Filled with beef and pork ragu, peas, egg and mozza, it's good to share and save space for the bigger dishes to come. 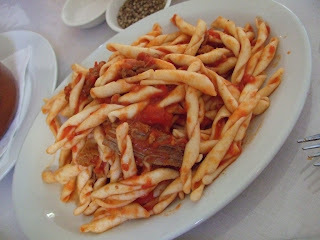 Macaroni with sugo Siciliano comes with a second slug of beef and pork ragu. It's undoubtably a hefty dish, with those flakes of beef, but the macaroni is fresh and light. The slow cooked purpetti dolce with cinnamon and tomato are exceptional. 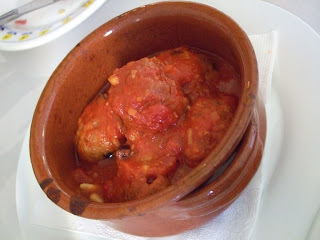 The sauce is redolent of cinnamon, but remains sweet and delicate - worth eating alone with a spoon, never mind the meatballs (particularly given we're now up to a triple serve of the signature meats)! As soon as we'd glanced at the menu, I knew we couldn't go past the frittedda: warmed broad beans, asparagus and peas are tossed with crispy, olive-oil-fried breadcrumbs, and topped with the tiniest of red onion shavings. 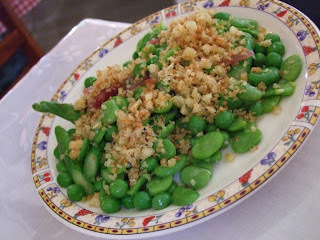 Eaten at the height of broad bean season, this was a dish I'd be happy to sit down to at every meal. Wine is available by the carafe and the white walls and tall windows bring in plenty of light - two factors that always contribute to welcome atmosphere. Just stopped by for the first time. Like your concept of literature & food. Plus, how ahead of the game do you feel when you've already dined at the Cheap Eats Champ and have a review ready to go! Uninspiring food, and occasionally disingenuous menu descriptions. I ordered the “pot roasted pork and spiced sausage with caramelised onion, black olives and vincotto” only to find said roast pork had was in fact hiding inside the sausages, of which there were three - the largest being the size of a walnut. “Secondi”? Only in price. To be fair the sardines were good, as was the citrus salad and the layered eggplant, though I would not think it possible to combine eggplant, basil, pecorino and tomato sugo in a way that doesn't taste good. Leaving me my sardine flavoured plate for the rest of the meal wasn't an example of great service. 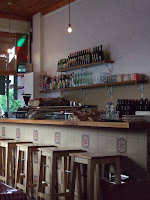 It's a shame that specificity of cuisine can pass for quality in the age where everbody is searching for authenticity. Hey Dennis, thanks for the thought-out review. The pork dish does sound like a surprising delivery given the description. It's true that we can get a bit wrapped up in intentions and forgive some poor execution. I haven't been back to Bar Idda in a while, but I hope their quality is keeping up with the kudos they're receiving. Went there last night. Never again. 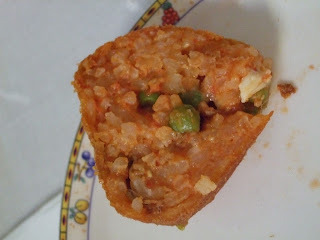 Miniscule servings, cold, stale, overpriced.Large list of what they don't have. Unwilling to move us to another table ...even though it was only a swap of a table for 2..extremley noisy. Will never go back and do not recommend. Way better places in the area.